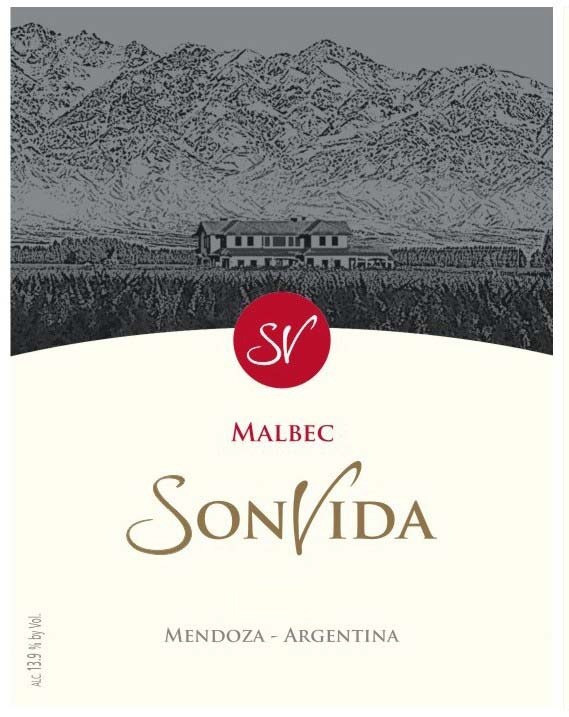 SonVida Malbec is a single vineyard wine, the supreme expression of the award-winning zone of Altamira, in Argentina's Uco Valley. Altamira's smooth tannins shine through, and the combination of acidity and minerality lead the wine to a long, integrated finish. "The wine is proud to be ripe and generous. Aromas dominated by smokey mulberry and blueberry. It's plush and coats the palate with bramble, blueberry and liquorice and the scent of vanilla. Immediately muscular and broad-shouldered in the glass, with a savory note, perhaps tapenade, running through the dense palate with mint and dried herbs on the finish. The oak will integrate over time, mixing its spice with the warm spice of fruit. - Joe Fattorini - The Wine Show"
Sunny Summer with moderate nighttime temperatures, followed by an early Fall. Grapes come from the Mendoza region, in the Paraje Altamira area. MACERATION: Total 25 days, first cold-soaked 5 days, 14 days fermentation at 24° C, plus 7 additional days. No filtration. SonVida Malbec can be enjoyed on its own, and matches perfectly with meats, chicken, turkey and hard cheeses. It is enjoyed best in good company. ‘Would you like another glass?’ The answer, almost always, is ‘yes’. "Former diplomat and journalist David Smith doesn’t make much wine, alas, but the quality is extremely good indeed. Subtle, refreshing and marked by the chalky terroir of Paraje Altamira, it’s a nuanced, skilfully oaked Malbec with precision, focus and impressive palate length. 2020-25"
SonVida is Sonia's life and David's dream. After an international career in television news for the BBC, ITN and CNN, Sonia began her adventure in wine. She is a Certified Sommelier of the Court of Master Sommeliers, and is studying for an international Wine MBA at the Bordeaux Ecole de Management, a grand ecole in France. After a career as a foreign correspondent for Reuters and ITN, David is now a diplomat with the United Nations. David is also a Certified Sommelier of the Court of Master Sommeliers, and holds an Advanced Certificate from the Wine and Spirits Education Trust (WSET) of London. Their terroir is defined by the Andes. They are at 1,029 meters above sea level. Snow melts high in the mountains, and waters the vines. The earth is strewn with rounded pebbles, carried down the Andes over millennia, by streams and glaciers. The sun shines brightly 330 days a year. The cooling nighttime breezes help the grapes keep their freshness and mature with full flavors.